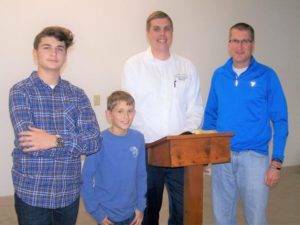 Emory and Ian Beck join dad Bruce Beck (right) following Pastor Joel Beckham's message to participants at the men and boys ministry weekend. That’s one of several questions that men should consider as they guide their sons and grandsons, says Joel Beckham, pastor of New Life Baptist Church, Henderson. Pastor Beckham spoke to participants in RHI’s 8th Annual Men and Boys Ministry Weekend. The Oct. 19-20 event began with a dinner and message at RHI’s warehouse. Assignments for hands-on projects in our communities were planned for the next day. Pastor Beckham encourages men to think about a last will and testament. The pastor advises, “Our teaching and conduct must match up” and men must “focus on much bigger things” than what the world proclaims. What do your boys see as your purpose? 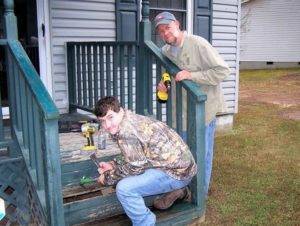 Justin Pendergrass (left) and Steve Cannon repair damaged steps and railing at a home in Henderson, an assignment in RHI's 8th Annual Men and Boys Ministry Weekend. Do your kids see yours as an active faith? Do they see that you have a Christianity that costs you something? Are you discipling them at home so they won’t be deceived? Will your sons and grandsons say they heard the gospel first from their dads?